In picking an insulation for your Gonzales rental properties, there are several different types you can choose from, all of which possessing their own pros and cons. Unless you have the necessary information to make an informed decision, choosing the proper insulation is going to be difficult. In what follows, we are going to discuss four of the most common home insulation types along with some pros and cons. Fiberglass insulation is intended for use in unfinished walls, floors, and ceilings. It is made out of glass fibers that were matted into fluffy (usually pink) batts and rolls. The size of these batts or rolls makes them perfect for installation between studs, joists, and beams. Besides being relatively easy to install, fiberglass insulation is fairly cheap as well, making it a popular choice. On the other hand, it can be irritating to the skin and airways, so gloves and other preventive measures have to be taken before using. Another problem with fiberglass insulation is that it is difficult to add to existing construction without tearing apart walls and ceilings. 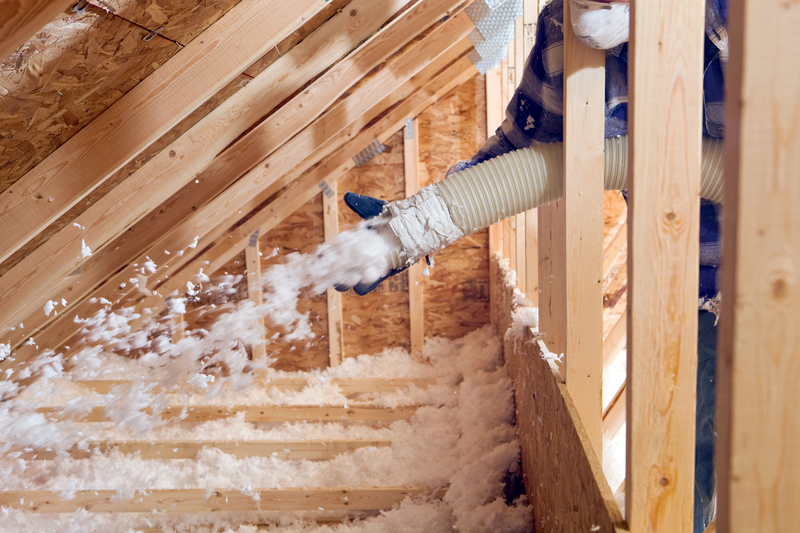 Loose fill or blown-in insulation is particularly handy when adding insulation to existing walls, attic floors, or other hard-to-reach spaces. Loose fill and blown-in insulation are usually made of dry cellulose, fiberglass, or mineral wool. The process of blowing in the insulation is perhaps its biggest drawback as specialized equipment must be used. Foam board is typically utilized to insulate concrete slabs and blocks. Made from strong materials like polyurethane, foam board can be installed directly into the walls of new construction. When adding to existing construction, foam board may be used to insulate foundation walls, floors, and ceilings. It has a great insulating value even though it is somewhat thin. Like blown-in insulation, however, foam board must be installed with specialized equipment and skills. Additionally, it is not fire or weather resistant, and so more layers are needed for a weatherproof finish. Sprayed foam is one of the most adaptable insulation types available. Made from a durable polyurethane, sprayed foam is meant for use in enclosed spaces, walls, gaps, and unfinished attic floors. It is easy to install around existing construction and pipes or other structures. You can buy sprayed foam in small containers for minor jobs, but greater quantities must be applied using special spraying equipment. Moreover, it tends to be more expensive than some of the other insulation types. In the end, the type of insulation you choose for your rental properties will be based on a combination of factors, including the cost, the current state of the home, and which areas need to be insulated. All types will increase the energy efficiency of the home, and so no matter which one you choose, you’ll be adding value and comfort to your rental homes in Gonzales. To find out more, please contact us online or call us at 225-389-6860 today!